I got some recipes that I make over and over again and just don’t get tired of them. 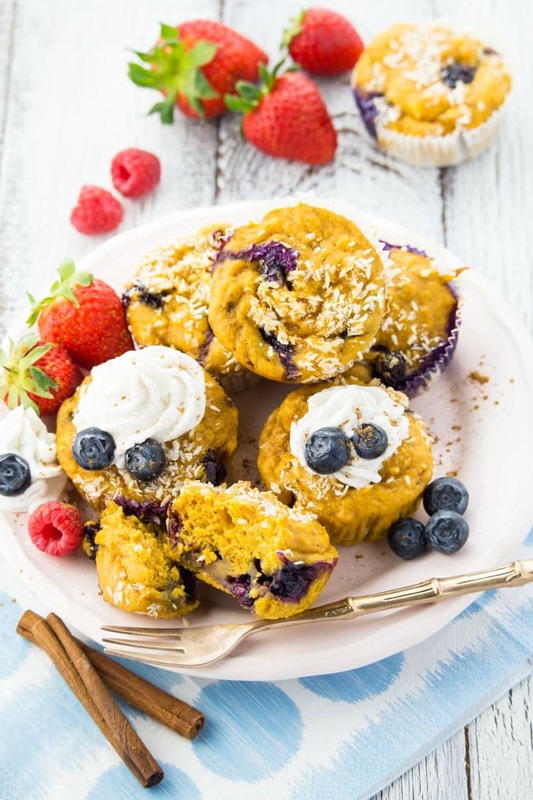 This recipe for sweet potato muffins with blueberries is definitely one of them! They’re super healthy, sweet, extremely moist, incredibly easy to make, and of course vegan! If you’ve been following my blog for a while now, you probably know that I love baking with kinda “crazy” ingredients. Black bean brownies? Oh, yes totally! Kidney bean chocolate hazelnut donuts? Count me in! Zucchini peanut butter chocolate muffins? Absolutely! So why not use sweet potatoes for baking?! I first made these years ago and over time I gradually changed the recipe until I was totally happy with it. 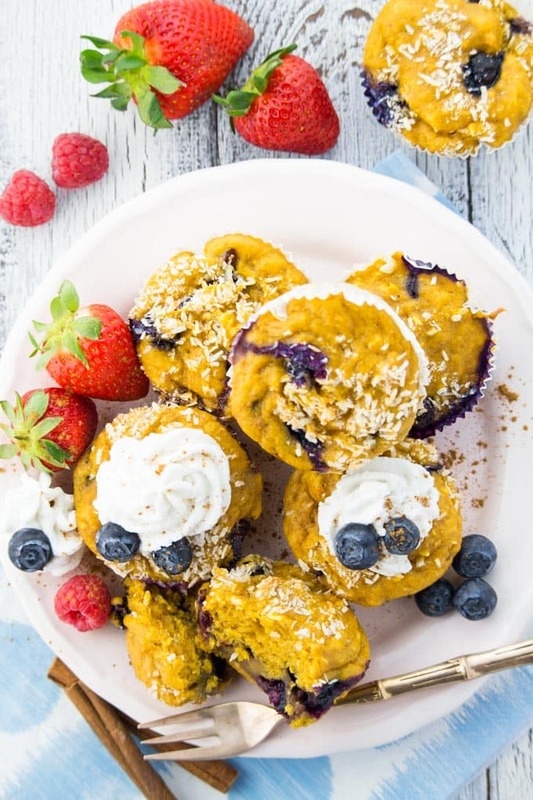 The best thing is that you don’t need any weird ingredients to make these sweet potato muffins. You probably got everything you need in your pantry anyways. All you need is about two sweet potatoes, flour (I used spelt flour, but any other flour is fine as well), cinnamon, baking powder, vanilla, sugar (most of the time, I stick with brown sugar, coconut sugar, or maple syrup), plant-based milk, and a little oil. I usually use almond milk for baking, but once in a while I also choose oat or soy milk and it works just as great. Sooo…Back to the recipe: To make these sweet potato muffins you first need to cut the peeled sweet potatoes into small pieces and cook them until they’re fork tender. This will take about 10 minutes. 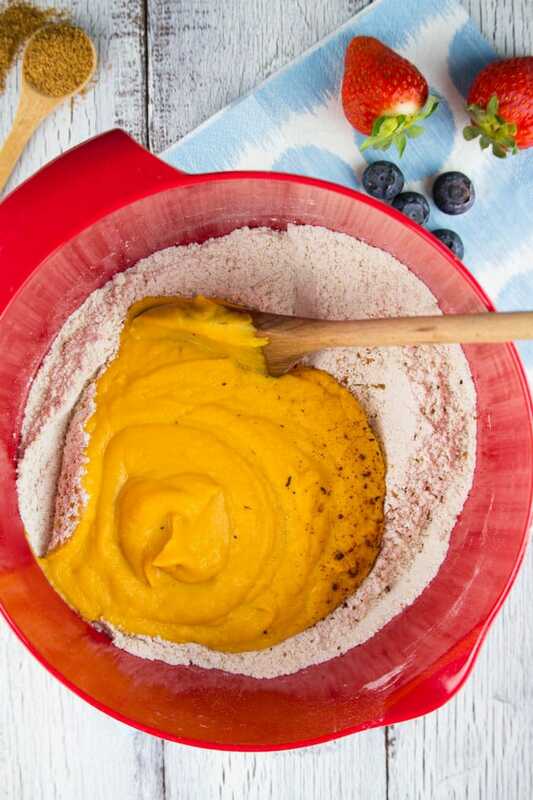 Combine the flour with the vanilla, cinnamon, sugar, and the baking powder in a medium bowl and blend the cooked sweet potato together with the milk in a food processor. Add it to the flour mixture and stir in the blueberries. Bake for about 25-30 minutes and you’re good to go! We enjoyed these little beauties with some coconut whipped cream on top, but they’re also great just by themselves! To make the coconut whipped cream, just place a can of full-fat coconut milk in the fridge for a couple of hours until it’s really thick or even hard. Then just beat it with a mixer until it becomes creamy and fluffy. I didn’t add any kind of sweeteners this time as I really like the coconut flavor by itself, but of course you can also add a little bit of powdered sugar or agave if you want. If you’re looking for a detailed tutorial on how to make coconut whipped cream, check out this post by the Minimalist Baker. 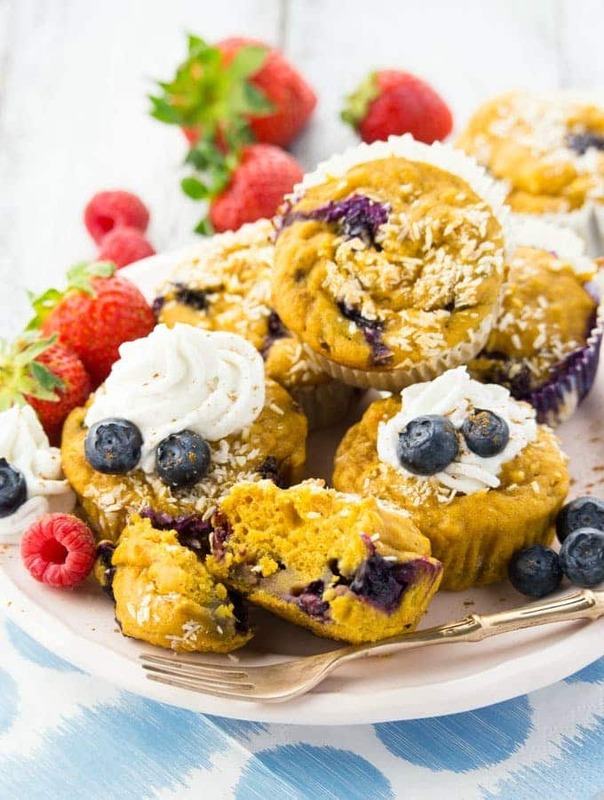 I hope you guys enjoy this recipe for sweet potato muffins with blueberries! If you give it a try, please let me know how you liked the muffins. 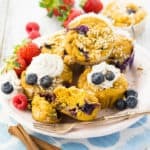 These sweet potato muffins with blueberries are super healthy, sweet, extremely moist, incredibly easy to make, and of course vegan! In a medium pot, bring some water to a boil and cook the sweet potatoes until they're fork tender. This will take about 10 minutes. Drain and place them together with the almond milk into a food processor and blend until smooth. In a medium bowl, combine the flour, the sugar, the baking powder, the vanilla, the cinnamon, and the salt and add the sweet potato mixture. Stir with a wooden spoon until combined. Add the blueberries and use a spatula or spoon to gently fold the blueberries into the sweet potato muffin batter. Bake at 350 °F for about 25-30 minutes depending on your oven. Let them cool down for about half an hour and serve them with homemade coconut whipped cream (instructions in the text above) and fresh berries. Enjoy! This sounds like such a fabulous combination of flavors! Oh, they sound so good!! Sweet potatoes in baking are just perfect! Love the color too! These look wonderful. I’ve never used or seen ground vanilla. Can I use Vanilla Extract instead? These are so pretty and look absolutely delicious! I love the texture they look to have. I’d devour these right up! Haha! Glad you like them, Alisa. :-) They’re also great without the coconut whip, but it definitely makes them look a bit cuter and I love how easy it is! I love baking with sweet potato. It lends such a lovely moistness to the crumb. 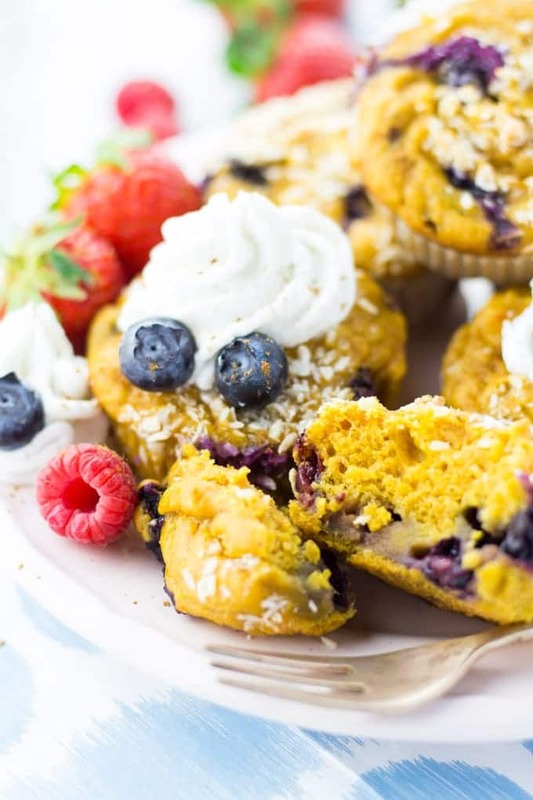 Your little muffins look so pretty with the juicy blueberries too! I don’t bake with sweet potatoes nearly enough. I love them, but generally I just make baked fries or casseroles with them. I love this idea. 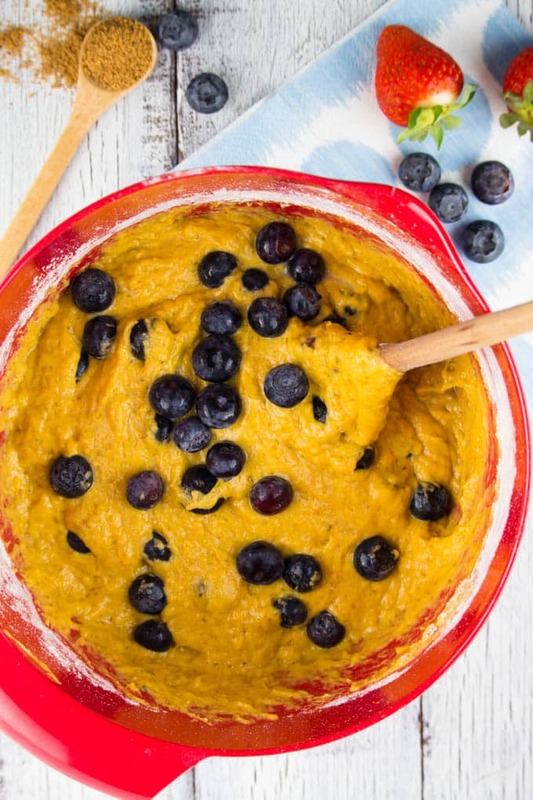 The blueberries with the sweet potatoes sound delicious! And I already want to try it with cherries too. 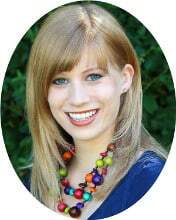 So glad you like it, Amanda! Oh yes, I’m sure it would be awesome with cherries. I really gotta try this soon. :-) And I totally agree, baked sweet potato fries are sooo delicious!! I love sweet potatoes, I know these muffins are very moist. Can’t wait to try them! Just curious, how many muffins does this recipe make? I see 4 servings, so is that a total of 4 muffins? Thank you!! These sound amazing and I will be making them VERY soon! I’m totally making these today! Question, though? Can I use agave as a sweetener, in place of maple syrup? Is the measure still 1/2 cup for either, in place of sugar? Thank you for this amazing recipe! Absolutely! Agave works really well in this recipe. Yes, I think 1/2 cup would be fine. Maybe you could even use a little bit less than that, depending on how sweet you want them. This recipe looks both delicious and beatiful I love the addition of the sweet potatoes, very creative and I must try this! 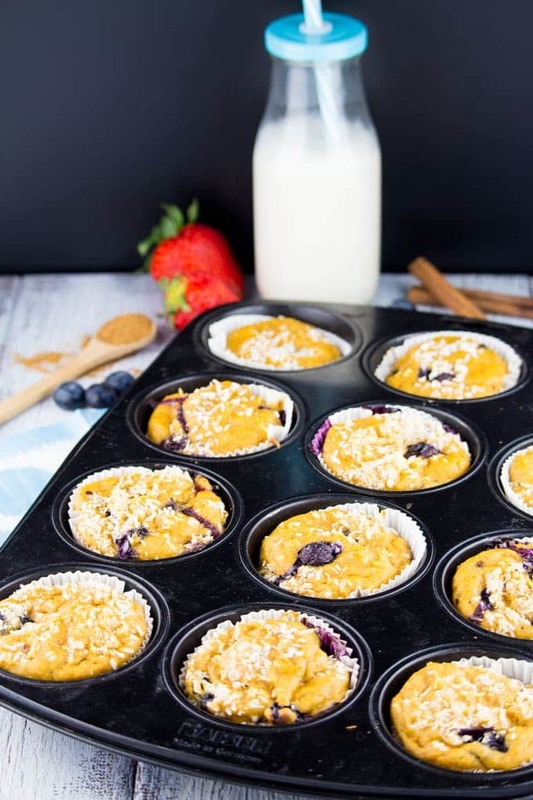 These muffins are so delicious! And easy to make. I didn’t have ground vanilla so I used vanilla extract…about a half tsp. I’m so glad I found you and your recipes. I’m now dairy free and am new to cooking like this. I found the recipe very accurate. Thank you! Just tried them, Sina! And they’re amazing!